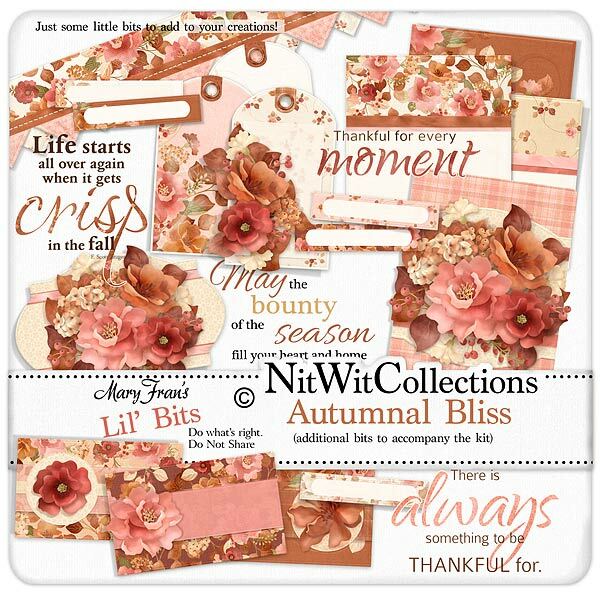 Lil' Bits "Autumnal Bliss" deserves a second look, and then a third....and!! Take in the sights of these exquisitely finished digital elements. The blends of the rich and light tones and the carefully placed elements all culminate into finished embellishments that could stand on their own as a card or finished journal cards for your layouts! Use these Lil Bits to quickly create that special layout or card, without sacrificing the finished item details! Don't miss out on these digital elements as they are not included in the FQB "Autumnal Bliss" Collection so don't pass these by! 1 Card front with a stunning floral cluster. Simply add your sentiment and print it! 1 Sentiment - "May the Bounty of the Season...."
1 Sentiment - "Life starts all over again when...."
1 Sentiment - "Thankful for every Moment"
1 Sentiment - "There is Always something...."